I love lazy days. I woke up and was going to go to work out, but I didn't feel well. I went back to sleep, and I will go to workout at the 6:20 p.m. class at TH. So, I slept but got up and had some good time in Romans, structuring Romans 1:18-32. I sent it to K and N after that. Then, we got to listening to The Story of the World: The Middle Ages, Disc 2, and I love it. While we did that, I did more Core Truths and Memory Verses from Discipleship Essentials. I love those truths, and it was good to type them in today and say, I LOVE THE BASICS of the Christian life! He makes it all so very simple. I also spent some time organizing photos, and I am pretty sure I have most of the Adobes integrated into the HP Premier, and I am not going to download into the Adobe anymore. Too confusing. The ten day trend is sunny weather. I am happy about that. I am hoping that I find this is true for my "inner weather" too. I am feeling better today. We had MJ's party, and I decided that I would be relaxed, and it was so very enjoyable. I love my mother-in-law, and she came to join in the fun. She knit and I organized photos from Adobe to HP Premier. Oh well, there is my dh to come to bed. I must get off this thing. I read most people's blogs, and they usually have such important and amazing things that they write, but mine is really quite boring! LOL! Oh well, I am just going to write. I am still not feeling really, really well. I purposely skipped Group Power again. I even woke up time, but I had no desire to go. I want to feel better. I need some iron and some water. I feel very lathargic. Part of that probably contributed to my meltdown at Bible study yesterday. I am a bit discouraged there, but I don't know what I can do to change that. I am just used to setting a very high standard, and I don't want people to feel judged in that. Oh, I have much to learn, but I don't have the energy to learn it right now. I just want to rest for a while. I had a whole post yesterday, and there was some kind of system error, and it vanished into thin cyberspace. I haven't been as good about keeping this blog up with my photoblog being a daily thing, but that is OK. Yesterday, I made a decision that I would walk a little slower and purposely slow down everything. My life really isn't that stressful nowadays, but I want to be even more purposeful about saying no and not doing anything that I have to rush around for. I know that this sounds like an impossible task, but I am going to do it. I had a glorious vacation, and you can check my photoblog for the pictures from that exciting experience with my mom and brother's family. I came back to being sick, sick, sick. So, I am just now eating solid foods again. The good news is that any weight that I may have gained over the Christmas break/scrapbook stress/California overeating was all lost! (Well, probably not, it is no doubt water weight!). I have had a peaceful three days back home, but I am missing fellowship after a week in California and missing my three Bible studies since I came back from CA. So, I am looking forward to fellowship in the car with V, C, and C.
Here is my "Well" status! I am back to full-leaded homeschooling with the boys. Rock cycle and catching up on the timelines and catching our Bible reading up to where we are in World History. A Warm and Wonderful Day . . .
even though the weather is close to freezing! I stayed up until 2 a.m. this morning not realizing that I was walking with Cathi this morning! She knocked on the door at 8:15, and I was still in bed. She is a safe enough person that I felt fine about answering the door in my P.J.'s! We had a lovely walk talking about family. I like her so much. I hope we can walk more in the future. Then, I hit the homestretch on this scrapbook. The boys did school, and I helped them along as they did things independently. My goal was to finish before Sherry did my hair at 3 p.m. George was so sweet to call and offer to take the boys to music lessons so I could finish up. Well, I made it to 1985, and I only had about 5 more pages left when I went to get my haircut. Then, I finished up the last 5 in less than an hour. YEAH. I went out on date to McGrath's with George, and I even remembered to buy a birthday card for mom! This is the verse that stuck out to me in my Bible reading this morning. I had a "ride over my head and fire and water year last year, but I feel like you have brought G and I to a place of abundance in our new church. I look forward to going every Sunday! I come back refreshed and like I have had fresh water poured over my head over and over and over again from the worship, teaching, and fellowship. This is what church is supposed to be like, and I didn't know what I was missing out on all those years. YEAH! I am feeling very weird right now. I finally got to putting my mom's 80th Birthday scrapbook together. We had taken most of my mom's pictures with us up to Oregon after we moved her to Assisted-Living because her closet space is so very small. I asked George to bring up the boxes and there were FOUR huge ones. There is one from the Walter family from my mom's side. There is one from the Wardrop family on my dad's side. The other two are pictures from our growing up in one and pictures from the time after my dad's retirement. I am trying to post daily. What a day. I had such peace. Great workout in a small class (only five people!) Got my act together with laundry and homeschool and cleaning up the house. Connected greatly with the kids. Lisa came and we had such GOOD fellowship and tea. I am so glad I quit the cooking class. It is freeing up my life more. I needed a totally free day. So, tea and happy kids downstairs. Long talk with Jan on the phone about life and homeschool and books and tons of stuff. Pizza and news and PBS Friday night good stuff like NOW and Washington Week and Foreign Exchange and McLauglin Group while I talked to Kat on PM. I had so many signs that you were there, right there. You are there . . .everywhere . . . whispering . . . loving me . . .loving the forum ladies . . . bringing all things to light. "I felt like today was a day where nothing could go wrong." youngest dear son. until he comes and showers righteousness on you. I am seeking the Lord on what that unplowed ground may be. So shoot me. I love to set goals. I love having a direction. WORDS - Words few and listen for purpose of prayer. Quick to hear, slow to speak, and slow to anger. WORK - Wake up to clean counters and sink. 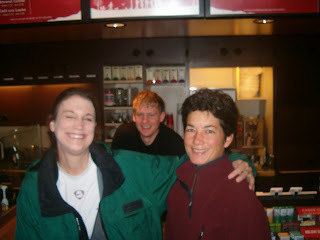 8:30 a.m. walk to Starbuck's with college friend, M. First Christian I met at OSU, 29 years ago. The ball drops to 2007! Toasting in the New Year with friends! To bed at 1:45 a.m.